Steve Wood and I headed down to Kaikoura from Picton, ridiculously early on Wednesday morning. We did an Oceanwings pelagic with Hadoram Shirihai, starting out from South Bay at 0730. 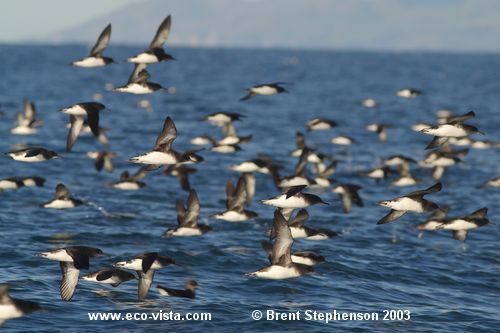 On heading out, we passed several Hector’s dolphins and then came upon several large rafts of Hutton’s shearwaters (c.1000+), which are at this time of the year preparing to breed. With the expert skill of the skipper Les Battersby, we were able to manoeuvre alongside the rafts of birds and get some great photo opportunities. At least one fluttering shearwater was seen amongst them. We then headed out into deeper water, along the way picking up our first white-capped alb, and the group of accompanying Cape petrels steadily grew. The only sooty shearwater of the day made a brief appearance also. We stopped at ‘The Lump’ and started berleying, soon attracting good numbers of birds, including several Gibson’s albs, white-capped and Salvin’s albs, and it was a great chance to go over some of the id features of the Gibson’s with Hadoram. Two possible snowy albatrosses put in an appearance, but weren’t the usually clearly defined birds that I have seen off Kaikoura before. Fairy prionswere unexpectedly coming in quite close to the boat and we were positioned perfectly for wind and sun, allowing great photo opportunities of these tricky little subjects. We were checking all of the prions to make sure there was nothing different amongst them, but didn’t pick anything up. 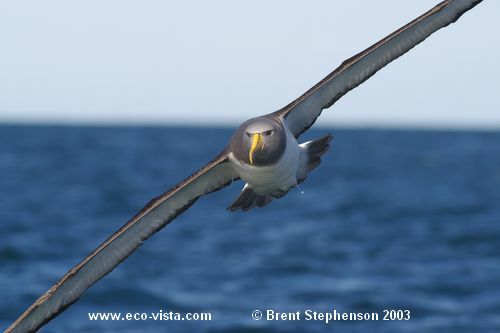 Several grey-faced petrels also made an appearance, along with Northern giant petrels. After chumming for just over ½ hour a darker headed albatross came in towards the boat and landed, giving us excellent views of a Chatham albatross. The bird appeared to be a sub-adult, still with quite dusky sides to the bill, but leaving no question as to its identification. The bird sat out from the boat most of the time, but at one stage made a pass of the boat very close, allowing a couple of good photos to be taken. Very happy to finally have caught up with this species properly, especially after the very brief ‘fly-by’ in Gisborne in late July. We sat chumming for quite some time, taking in the birds, and a sub-adult Southern Royal came in, followed later by another older bird. An immature and an adult black-browed also made brief appearances, the adult coming in to the back of the boat for a brief look. We eventually moved in a little closer to shore, hoping to see a Southern fulmar, but no luck. Many of the birds had followed us in. We decided as there was no afternoon trip planned to head back out a bit further, so headed out past ‘The Lump’. Again we hit similar species, many of the birds probably being the same individuals. By this time it was starting cloud over and get a lot cooler. We finished chumming after some time, with the only new bird being a very wary Westland petrel that did a very wide circuit of the boat and then headed away again. Headed back in to South Bay around 1300 hours. A very enjoyable trip, with some good birds and great photo opportunities, not to mention the excellent identification tips from Hadoram.